Born in Hamburg, Patrick De Bana studied dance at the Hamburg Ballet School and then joined the Béjart Ballet Lausanne (1987), where he was promptly promoted to principal dancer. In 1992, he joined Nacho Duato at the Compañia Nacional de Danza, where he stayed for over ten years as a principal dancer. He danced in ballets by Kylian, Naharin, Forsythe, Ek and many others in the repertoire of the company. 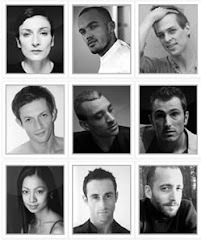 In 2003, Patrick De Bana created his own company, Nafas Dance Company, which won an award as the best dance company from the Generalidad of Valencia, Spain. He choreographed and performed in the movies Iberia (2004) and Fado, which were directed by the famous film director Carlos Saura. Creations then succeeded: Obras Poeticas for the Incolballet in Columbia, Creatures, staged by the Introdans company in the Netherlands, The picture of… (2008) for the Paris Opera étoile Manuel Legris and Marie-Antoinette (2009) for the Paris Opera étoile Agnès Letestu and himself. In 2007, Patrick De Bana toured Europe with the world-famous fado singer Mariza. In 2009, he created and performed Encounter, an exchange between a dancer and a percussionist, and Nefes (2009), a male duet which was premiered by himself and Manuel Legris. In November 2010, he created Marie- Antoinette, a large ballet for the Vienna Opera. With the Nafas Dance Company and as a guest dancer, Patrick De Bana performs all over the World.